Carl Scheele was a Swedish apothecary who discovered oxygen (c.1773), perhaps a year before Joseph Priestley's similar discovery. He also discovered chlorine (1774). In his short lifetime of 44 years, Scheele (pronounced Shay-ler) helped lay the foundations of inorganic chemistry, photography, and heat physics. Many of his discoveries proved later to be very important although Scheele himself could not be aware of the way in which they were to develop. When he discovered that the violet end of the spectrum would blacken certain silver salts, he couldn't possibly have known that from this a photographic industry would arise. To him, his discoveries were just exciting and fascinating. Scheele was a contemporary of Priestley and Henry Cavendish. News of scientific experiments was freely circulated between these three men and very often there is some doubt about which of the three was the real discoverer of some fact. For example, in the Priestley laboratory oxygen was being prepared and collected only a short time after it had been prepared by Scheele. Scheele was the seventh child of a merchant. He had no formal scientific training and never sat a science examination in his life. This was probably more of an advantage than a disadvantage, for scientific thinking at the time was bogged down by too many fake ideas. This didn't bother Scheele; he did not know half of them existed. At the age of 15 he was apprenticed to an apothecary where he began studying on his own and experimenting in the shop. In the latter part of his life he kept he kept his own apothecary's shop, rejecting offers of salaried posts which would have hampered him. He preferred to work on his own and not at the beck and call of someone else. Scheele was the first person to prepare the gases oxygen and chlorine. Oxygen, he prepared by several different methods, starting from saltpeter, mercuric oxide, manganese dioxide, and other substances. His chlorine was made by the action of hydrochloric acid on manganese dioxide. 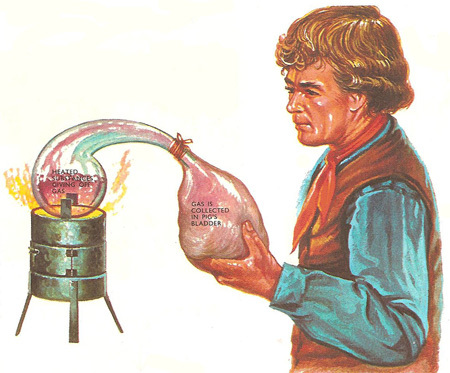 He collected his gases by squeezing the air out of a pig's bladder and fixing it over the open end of a retort in which the gases were being made. The bladder swelled out as it filled with gas. Scheele recognized that one gas he had prepared was the part of the air responsible for burning. Air was in fact a fifth oxygen, as Scheele discovered when he burned some phosphorus to 'use up' the oxygen in an air sample. The test now used in inorganic chemistry to discover the presence of a sulfate was yet another of Scheele's discoveries. So was the preparation of tungstic acid. The tungsten metal now used for the filaments of electric light bulbs is extracted from its ore by converting the tungsten in the ore into tungstic acid. The ore scheelite is named after him. Organic chemistry also interested him. He discovered glycerol, and many organic acids were the subjects of his study. Heat physics, too, was his interest. Transfer of heat by convection and conduction was known at the time but Scheele was the first to observe the heat transfer by radiation. These are just a few of the many scientific discoveries by made him.